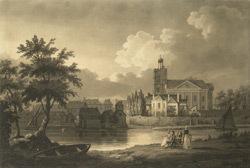 The village of Twickenham was located along the banks of an attractive stretch of the River Thames, upstream from the City of London. The river here is broad and gently bending. This view is from the banks of Eel Pie Island, a favourite place for boating parties overlooking a number of houses. The large redbrick mansion is likely to be York House or Orleans House.